Not exactly the kindest way to say goodbye. Last week we reported that Mitsubishi "Final Edition" examples of the Lancer Evo. And when Mitsubishi says "Final Edition," they mean it; this will be the last Evo as we know it. No replacement is planned. 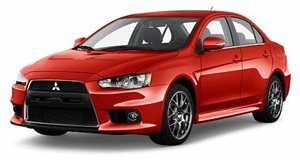 And for all of the love US enthusiasts have given the Evo over the years, Mitsubishi won’t sell any of the Final Editions stateside. Damn shame, and here’s what you’re missing out on: based on the Evolution GSR, the Final Edition is powered by a 2.0-liter turbocharged four that’s been upgraded with sodium-filled exhaust valves. Power is sent to all four wheels via a five-speed manual. Exact output figures so far haven’t been announced, but around 295 hp and 270 lb-ft of torque. 18-inch BBS wheels, upgraded Bilstein and Eibach suspension components, and a Brembo braking package are also included. The exterior comes complete with Final Edition badging, a black grille, and a choice of five exterior colors: grey, black, blue, white, and red. The interior receives partial leather Recaro seats. Official pricing hasn’t been announced, but along with Japan, Australia will also be allocated a few units. Apparently America wasn’t loyal to either Mitsubishi or the Evo.